Why Use Link & Smith, P.C.? Our Personal Injury Lawyers have nearly forty years of combined experience serving the Southeast. Our law firm represents only injured persons and does not lose focus by branching out into other areas such as criminal law, family law or wills. We’re ready to speak with you when the time is right and you feel comfortable. Should I hire a Personal Injury Lawyer located close to me? There is no need to hire a Personal Injury Lawyer close to you, and sometimes it is advantageous to hire a Law Firm that is not closely aligned with your local area. Our firm practices personal injury law in Georgia, Alabama and Florida. What does “full coverage” mean for car insurance? The term full coverage has no specific legal meaning. The term is misleading because it may suggest that a person has more insurance coverage than they actually have. We recommend at least $100,000 for liability and UM coverage. The Claims Settlement process generally takes 60-90 days after the client is finished with medical treatment. Cases take longer when lawsuits are filed. Are Insurance Companies on your side if you are hurt? Injured in a car accident? Before contacting an insurance company, it’s important you speak with a qualified Personal Injury lawyer to preserve your rights. Why? The insurance company will settle the case quickly for the least amount possible when it comes to personal injury insurance settlement. No Out of Pocket Cost to hire Link & Smith P.C. Did you know that hiring a Personal Injury Lawyer requires no out of pocket cost? Our lawyers work on contingent fees, which means that even clients of modest means can hire specialist injury attorneys. Houston Smith explains UM Insurance under Georgia Law and why it is important to have UM coverage equal to your auto insurance liability limits. 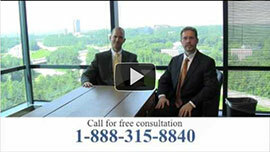 Can I get a FREE consultation with a Personal Injury Lawyer? Absolutely. Most people don’t know that they can speak to one of our lawyers about their case without any commitment. Our lawyers work on a contingency fee basis which means we do not charge you unless you receive a monetary award either thru settlement or verdict. We understand that clients are often without a car or forced to take off from work due to the serious and debilitating nature of their injuries, thus the last thing an injured victim can do is hire and pay for an attorney on an hourly basis. We offer free telephone consultations, free office consultations and even free in home consultations. What do Injury Lawyer typically charge? Each and every injury claim is different and the amount of work and expense involved varies from case to case. On a typical car wreck case our law firm charges a contingency ranging from 33 1/3% to 36% depending on the nature of the car wreck. If the case does not settle prior to filing a lawsuit they contingency fee may be scaled up, since trials are often long and expensive. All of our fees are contingent in nature which means you owe us nothing until you receive a monetary award thru settlement or verdict. We will not send you bills for our time or expense during the case and you will only pay when you are compensated for your injuries. For more information read our article on How to Get a Free Consultation with a Personal Injury Lawyer. If you have been injured thru no fault of your own you most likely have a viable injury claim. Cases involving car wrecks, slip and falls, workplace injuries are often clear cut and it will be obvious whether or not you have a case. However some of our best trial results have occurred when it was not so obvious. If you have been ticketed for causing a wreck you may still have a case. Police officers are not perfect and sometimes they ticket the wrong party. In one case our client was deemed at fault when he turned left in front of a tractor trailer, however our tractor trailer accident lawyers were able to prove that the big rig driver actually caused the wreck and the jury awarded in excess of $11 million. If you or a loved one have been injured and you believe that somebody else caused the incident call us for a free no obligation consultation.